I have not unveiled the final images as I am needing to add a few more canvases and curtains to my space, but in the meantime, I thought I would share some of my answers I gave from messages and emails online. Designing a home bellydance studio does not have to be crazy expensive, although it will be an investment nonetheless. Here are the main components of my studio listed and the why and how behind it. Mirrors: Craigslist is my best friend. I bought three 4×8 mirrors from Craigslist for $125.00 this is a huge bargain compared to buying the same amount of mirrors new. Used mirrors are not perfect, mine was left outside and covered in overspray from painting, but with a $6 pack of mirror blades and some elbow grease, these beauties were restored to almost new. $125 is just about what you would spend on mirror sliding closet doors which are much smaller in comparison, so it is a heck of a deal. 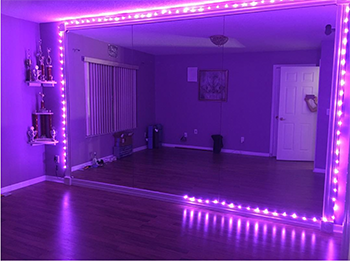 You can find used dance or gym mirrors on Craigslist quite easily, so get on there and stalk the threads for a month until the perfect one comes around. LED Lights: The LD lights I placed around my mirrors were not expensive at all. In fact, they cost $12 on Amazon! These beauties come in a variety of colors, shine very brightly, and are super lightweight and easy to shape. I used invisible tape to adhere it to my mirror molding and it works great. The LED wire is very long, so you have quite a bit of room to space with the configuration. Artwork: I LOVE Hobby Lobby! This ginormous warehouse of home décor is the perfect place to find great deals and pretty much everything you need to decorate. Molding: This is NOT cheap. In fact, the molding was a big splurge, but my oh my does it make the mirror looked finished and polished against the wall. Very worthwhile investment to give a more professional look and add character. There are beautiful designs. I chose a braided style as I wanted something unique and not basic. Cost me $160 for decorated molding. Storage and Shelving: My students often come in with their show bag, notebook, purses, and water. I found an inexpensive solution of where to store my fabrics, products and offer storage to guests in the cube shelf organizers from Home Depot. There was a sale when I bought them for 30% off, so it only cost me $35 for a large sized one. There are perfectly fitting cloth bins that become drawers in each cube, and that is where one can store their needed items. Flooring: This was a headache in the beginning, and then I found out about Lowes flooring program. Basically, you purchase the materials, and the Installation is paid for by Lowes! They charge a few fees of course, but no tax is added to your bill! They take care of everything. You pick your floor, your underlayment, and then a professional comes out and measures your space. Once the measurements are registered into their system an appointment is made with the installers. Once your flooring arrives, installers come to your home and assemble it to perfection. Pretty simple and easy. Dance studios are pretty simple, but I thought I would share just my own take on it and the vendors I used. If you are dreaming of designing your own home bellydance studio, it will not break the bank so long as you are ready to put in some work. Hope you enjoyed this blog, and make sure to subscribe and visit my online studio Savvy Bellydancers to stay up to date on the latest!